Preheat the oven to 350 degrees F. Spray a muffin pan with cooking spray or line the cups with paper liners. Prepare the German Chocolate Cake with Coconut-Pecan Frosting according to the package directions. Before placing the cupcakes in the oven, press one of the BUTTERFINGER® Minis into the batter and cover with batter. Bake according to package instructions, and let cool. Frost the cupcakes with the coconut-pecan frosting. 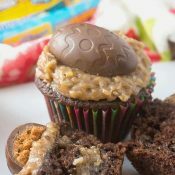 Place one of the BUTTERFINGER® Cup Eggs on each cupcake.